Inorganic artifacts are those made from the earth's crust. These objects characteristically will not burn if ignited, are insensitive to light and humidity, are organic or glassy in structure, are brittle, and range from being porous to dense, and from soft to hard. Objects of this group are made from stone, metal, glass and clay. 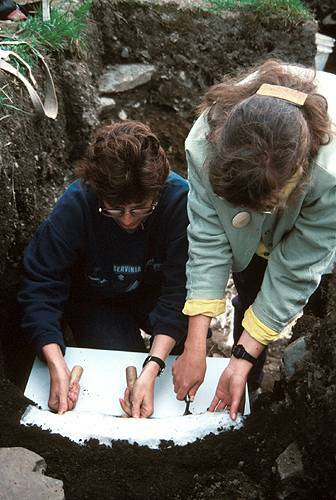 The numerous ceramics found at Ferryland come under this category. Generally the ceramics are fairly stable, but they sometimes require a special excavating technique to remove the crushed sherds from the soil. The photograph below shows conservators blocklifting, using a gauze and wax support to remove coarse earthenware vessel(s) from the ground. Conservators blocklifting, using a gauze and wax support to remove coarse earthenware vessel(s) from the ground. Ceramic types include stoneware, coarse earthenware and tin-glazed earthenware. 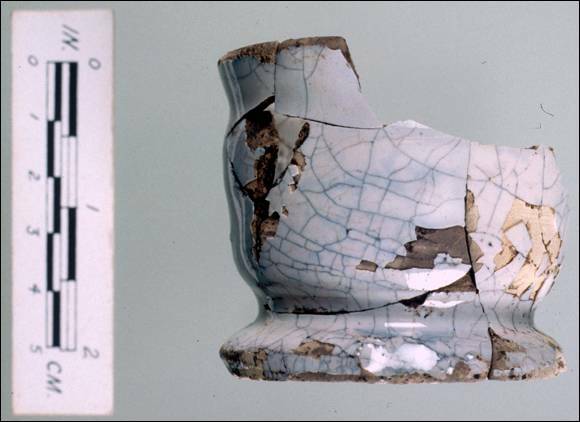 The photograph below shows a white tin-glazed "puzzle jug." The ornate design of the jug demonstrates the skill of the 17th-century potter. Tin-glazed pot, commonly known as an ointment pot. 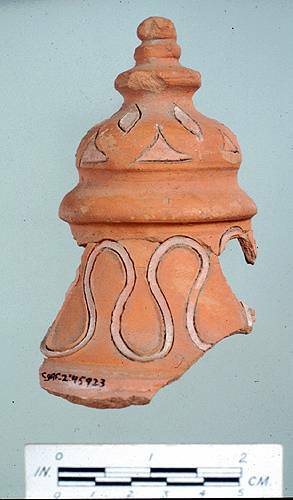 Possibly the most unusual ceramic type found at Ferryland to date is the terra sigillata ware which was manufactured in the village of Estremoz in Portugal. These burnished, unglazed orange earthenwares have distinctive shapes and are often decorated with incised geometric patterns, curvilinear designs and floral motifs painted in a fine white clay. Such ceramics were made at Estremoz, Portugal, in the 16th and 17th centuries. They were luxury items, and the Ferryland collection includes the only such ceramics found in the New World. In the 17th-century terra sigillata pottery was probably owned only by nobility and wealthy citizens. Thus the terra sigillata ceramics found at Ferryland may represent possessions of the Calvert or Kirke families. Metal objects found at Ferryland are made from iron, copper and copper alloys, lead, pewter, gold and composite materials. The best preserved or most stable metal from a burial environment is gold, which does not show any signs of alteration. 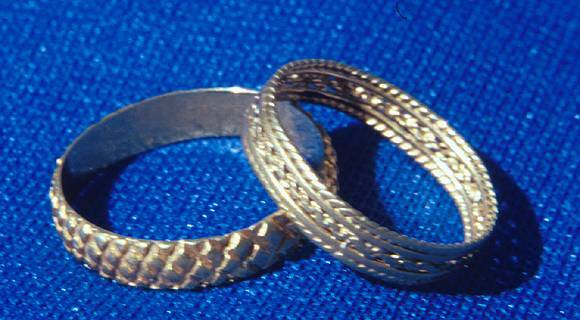 An example can be seen in the excellent preservation of the gold rings. Right - Gold finger ring consisting of a fine chain, two small bands and a twisted gold wire, found in a layer dating to the last years of the 17th century. It may have been lost during the French attack on September 21, 1696. Left - Gold finger ring with cross-hatched decoration, found only two metres from the other ring and probably lost at the same time. The two rings are of different sizes. Iron is the most fragile metal, as it readily reacts with the components of the burial environment. The most damaging constituent of the soil for iron are chloride ions generated by salt water. Treatment for iron involves removing the harmful chloride ions using chemical cleaning methods. 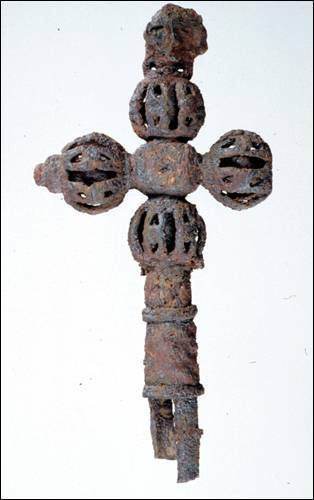 Some iron artifacts, such as the iron cross consisting of iron, brass and gold, must undergo complex and lengthy treatments. The cross required approximately 250 hours of treatment to be conserved because of its complex composition. The cross required approximately 250 hours of treatment to be conserved because of its complex composition.